Review date: 4 February 2002. Do you know what the problem with computers full of fans is? Hmm. Let's talk further away from the PC. If you don't like the idea of a computer that sounds like a big-chinned guy's motorcycle, you have a problem. When the ambient temperature is low, you see, you can get away with relatively low throughflow ventilation in your PC case. And you probably don't need massive fan power on your CPU heat sink either, even if you're into overclocking. When the ambient temperature's high, on the other hand, more air needs to be moved over things in order to keep them acceptably cool. Lots of cases are untidily packed with cables and only have one little fan on the CPU and a lazy dust-clogged 80mm unit in the power supply; those cases are likely to be hot-hot-hot inside even when the ambient temperature's quite chilly, and they're not a good environment for a high-power Athlon or super-fast graphics card. If your computer room is climate controlled then your cooling challenges are going to be the same regardless of the time of year, but mine isn't, and I live in Australia. My computers put up with ambient temperatures from about ten degrees Centigrade to about 35, in the course of a year. That's not exactly a Saharan temperature range, but it's quite enough to make a PC that worked fine in winter go flaky in summer. Many overclockers just go for overkill; install far too much fan power, run everything at full speed all the time, and you're in business. You may end up wearing earplugs while you work (I've done it! ), but your computer's definitely cool. For a less obnoxious solution, you can use fans with manual speed controls. 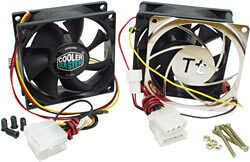 Lian Li makes cases with speed-switchable front fans (like this one, and this one, and this one, and this one, and these ones too), for instance, and you can also get in-line speed controls for fans that use either a simple variable resistor or a more elegant transistor-based design. Turn 'em up in the summer, turn 'em down in the winter. Or, for greater automation, you can use a fan control gadget like Macpower's very popular DigitalDoc5. With multiple fan outputs and multiple thermal sensor inputs, a DigiDoc can change fan speeds in response to the temperature of the things the fans are cooling. The DigiDoc's not the world's cheapest product, though. Between a simple manual control and a fancy-thing-with-LCD-display in price and complexity are these gizmoes. They're 80mm fans whose speed is controlled by the temperature of a thermal probe. You plug them in like any other fan, and hey presto, you've got an air-shifter that won't make a racket unless it has to. The one on the left is Cooler Master's DAF-B82 Case Fan. Their page for it is here. The DAF-B82 kit gives you, in addition to the fan itself, four high-pitch mounting screws suitable for attaching the fan to anything made of plastic and various other things besides, and a four-to-three-pin adapter that lets you run the fan from a normal power supply connector, if you don't have a spare motherboard fan header. The adapter has a passthrough four-pin plug, so you don't need a spare power supply plug to use it. Use the adapter and you can't monitor the Cooler Master fan's speed - it's a three-wire, speed-reporting unit, and in three pin plug mode it'll work fine with modern hardware-monitoring motherboards. The power wire's a generous 28 centimetres or so (11 inches), so there's a good chance you'll be able to stretch it to a motherboard plug. The DAF-B82's temperature sensor is on the end of about five inches of wire, so you get some choice about where you put it. If you're handy with a soldering iron, you can also easily extend the wire; the "thermistor" temperature sensors used by both of these fans have resistances of many thousands of ohms, so you can add yards of feeder wire on them without changing their behaviour. 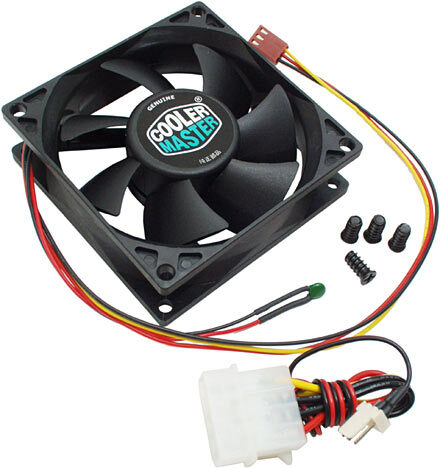 Cooler Master say this fan's rotational speed will be a very modest 1000RPM at 23 degrees Centigrade or cooler, and will rise to 2500RPM by the time the thermal probe gets to 45-50 degrees. They rate it as a 1.8 watt unit from 12 volts, with a maximum stalled power of a little more than two watts. Fan power ratings are almost always overstated, to stop people from blowing up a power supply with a fan's startup current. The number on the fan sticker is the startup power; the actual run power of the fan once it's up to speed is lower than that initial peak. If you jam the fan blades, it'll draw even more current than it does on startup - that's the stall rating. The brushless motors in all current computer fans will survive being stalled for ages. This fan's power rating is on the low side, but it's still got a spindle supported by twin ball bearings. The bearings should, thanks to the low speed of the fan, last very well. The street price of the DAF-B82 should be $AU30 or less ex shipping; in the States it should sell for $US15 or less. That's more than you'll pay for a plain twin-ball-bearing case fan, percentage-wise, but not a lot more actual dollars; all standard sized computer fans are pretty cheap. Here's the other fan, Thermaltake's A1214 Smart Case Fan. This is the same fan that Thermaltake provide on their hefty Volcano 7 CPU cooler (which I review in my cooler comparison), and it comes with the same shiny finger guard, too, plus machine screws and nuts for mounting it. There's another four-to-three-pin adapter with this fan, and it needs it; at full power this thing draws more than five watts, and that's more than your motherboard is likely to enjoy delivering. You don't have to sacrifice speed monitoring to use the adapter, though, because there's a separate three pin connector with only the tachometer wire connected to it; because the power and tacho circuits share the same earth, this one-wire plug can be connected to the motherboard and speed monitoring will work. 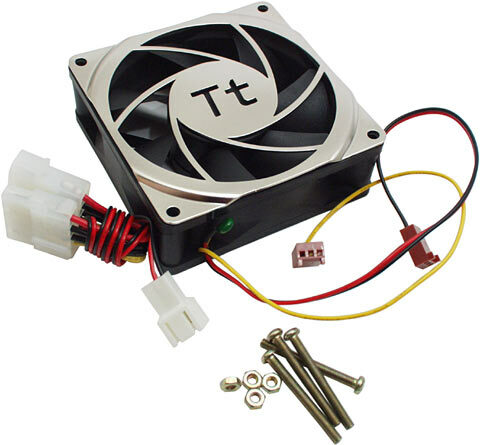 The power and tacho wires on the Thermaltake fan are less than 20cm (eight inches) long, though, so you'll need to extend the tacho wire if you're not using this fan quite close to a three pin header. You'll also need to do some soldering if you're unhappy with the Thermaltake fan's temperature sensor position, because it has basically no wire on it. Bend it out from the side of the fan and it only sticks out about a centimetre. If you unhook the thermal probe wires from the little holder in the side of the fan housing and bend the thermistor straight up from the hub assembly, it stands up about 5cm (two inches), on the downwind side of the fan. Because of the abovementioned high resistance of the thermistor, it's perfectly possible to greatly extend the wires if you like, without affecting the fan's performance significantly. The Thermaltake fan's got dual ball bearings, like the Cooler Master, and it's got more need for them. It has a rated power of 2.16 watts at 2900 RPM, which it's supposed to do at 25 degrees Centigrade. At that speed, its free air airflow rating (the amount of air it's supposed to be able to shift when there's nothing at all obstructing the flow) is 46 cubic feet per minute (CFM). At 35 degrees Centigrade, though, it's supposed to draw 5.4 watts, spin at 5000 RPM, and shift 53CFM. That's only 1.15 times as much air as it's meant to move at 2900RPM, though; 5000RPM is more than 1.7 times 2900RPM. If that's really the case, then there are some serious turbulence issues here. According to the graphs on Thermaltake's page for the A1214, it's supposed to sit on 2900RPM from zero degrees to 25, then speed up as it gets warmer, and hit full speed at 35 degrees. Thermaltake's graphs are, however, often more decorative than informative; I take them and the CFM figures with a grain of salt big enough to pitch a tent on. The lowest US prices for the A1214 at the moment seem to be little more than $US10 plus shipping; Aus PC Market now have it in stock for $AU27.50, but that includes Australian delivery. So despite its shiny trimmings and imposing top speed, this is another product without a premium price. When I checked these fans out, the ambient temperature was 22°C (71.6°F). With the sensors at this temperature, the power difference between the two fans was obvious. The Thermaltake drew a bit more than three watts and made more noise than the average medium-power case fan; the Cooler Master was much quieter, but much slower too, and drew a little less than 0.8 watts. Fiddling with freezer spray, a hot blow gun and a digital thermometer gave me some halfway accurate ideas about what these fans actually do. The lowest continuous-run power draw the Cooler Master manages is about 0.6 watts; that happens at a sensor temperature around 5°C (41°F), though, which is not a temperature that you're likely to find inside a running computer's case. The DAF-B82's maximum run power is between 1.5 and 1.6 watts - about the same as the run power of your average low-grunt case fan. It took heating the sensor to about 40°C (104°F) to get it up to that speed; various easily reached objects inside a computer get that hot in normal operation, so there'd be no trouble finding a place for the sensor that'd allow the fan to get to full speed when needed. The Thermaltake fan's minimum run power, in contrast, was more than 1.3 watts - and its sensor apparently needed to be a bit colder than the Cooler Master's in order to get the thing turning that slowly. When you're dealing with more plausible computer case temperatures, the A1214 pretty much starts where the DAF-B82 finishes. The A1214's maximum run power was above 6.5 watts, which makes this a quite high power fan. And a loud one, too; 80mm high power fans don't generally scream as high as 60mm ones, so they're less horrible to be near, but they're still noisy. To get full power out of the A1214, I had to heat the sensor up a bit warmer than the Cooler Master's thermistor. So with the standard sensor position, you may or may not ever manage to get full power out of this fan. You probably won't if you're using it as an intake fan; you might if you're using it as an exhaust or CPU fan. For more flexibility, you really need to extend the sensor wire. When I checked out the same Thermaltake fan on the Volcano 7 in my cooler comparison a while ago, I got lower numbers. I was testing it from a normal computer power supply that time, though, and through the ammeter its input voltage could easily have been significantly below 12 volts. This time I used my bench supply and carefully made sure each fan got exactly 12 volts after the ammeter, though, which probably explains the discrepancy. Or maybe Thermaltake are just making slightly beefier fans now. Neither of these fans is particularly well balanced, so they'll create significant audible vibrations in anything to which they're firmly attached, even when they're running at minimum speed. To get around this problem you can use rubber standoffs on the mounting screws, or mount the fan on a bead of some sort of mastic. Neutral cure silicone will do nicely. If you want to upgrade an 80mm-fan-compatible CPU cooler with a fan that can scream when it's needed but won't when it isn't, the Thermaltake A1214 is a pretty good choice. With an extended thermistor wire, it's a better one. And the price is right, and the finger guard looks spiffy. The Cooler Master DAF-B82 doesn't have anything like the Thermaltake fan's power, but it's still a perfectly good choice for case ventilation, or other purposes where Ludicrous Speed isn't necessary. It comes as standard with a useful amount of wire on everything, too. If you're looking for a way to make your polyfannular PC a bit nicer to live with, either (or both!) of these products can help. Cooler Master fan kindly provided by Rectron. Thermaltake fan kindly provided by Thermaltake. Readers from Australia or New Zealand can purchase the Thermaltake Smart Case Fan (but not the Cooler Master fan) from Aus PC Market. The thermistors that control these fans are both made by the same company, Thinking Electronic Industrial. The Thermaltake has a TTC-103, the Cooler Master has a TTC-123. There's little difference between the two thermistors, but there's enough that the fans probably wouldn't work right if you swapped them. The TTC-103's got a 25°C resistance of 10 kiloohms, while the 123 scores 12; both have lower resistance the hotter they get, which is why these are called Negative Temperature Coefficient (NTC) thermistors. The TTC-103 has a slightly higher Thermal Time Constant than the TTC-123, so it'll react a tad slower to temperature changes. That makes no difference to anything for fan control purposes. Both thermistors have a working temperature range of -30 to 125°C. Thinking has a page for all of their TTC-series thermistors here.